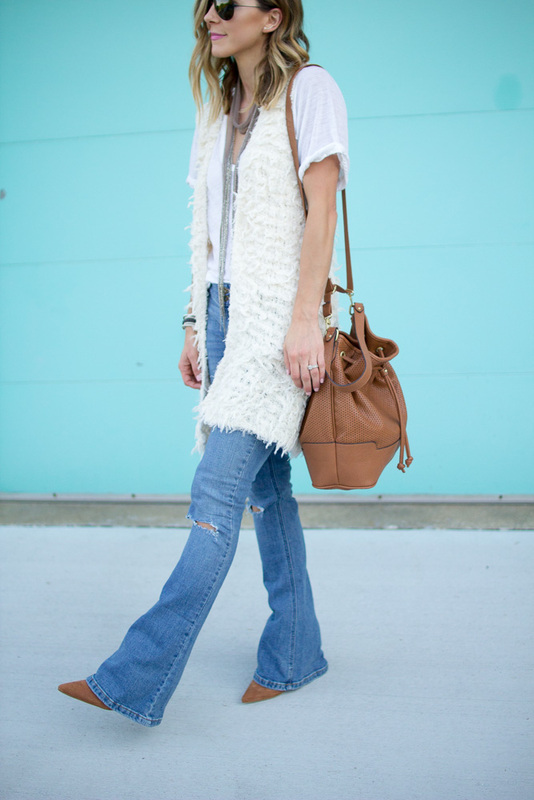 I am all about flares and long vests for layering this fall. 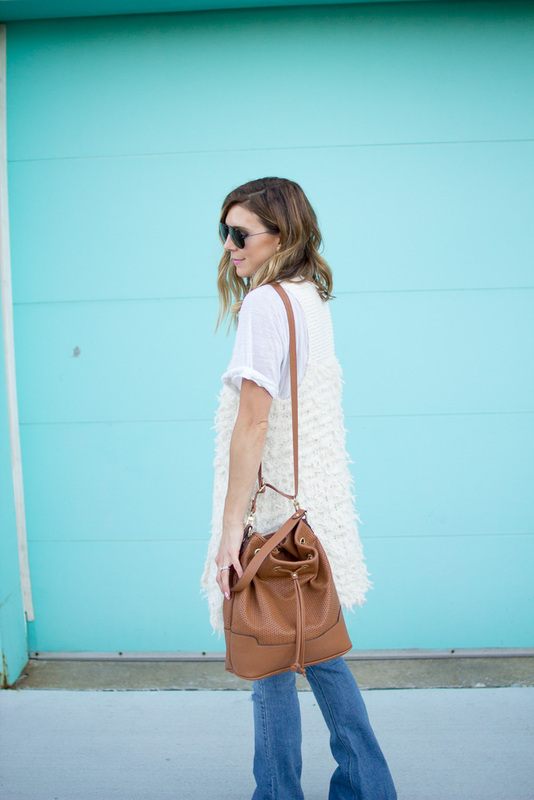 Vests are great for laying and when it’s a neutral color, they go over almost anything. If you are looking for a cute pair of flares under $100, these are your bet. They fit true to size and very flattering. I love the ripped knee detail. Lastly, these booties have become my favorite. You can see the fringe detail in the pics, but they are darling! I love the pointed toe and they wear well with flares. Come in three colors. Jeans-fit true to size wearing size 27. Booties fit true to size. Tee-fits true to size and wears oversized. Any questions, don’t hesitate to email me. Thanks for taking the time to stop by, love you guys! Lovely outfit! 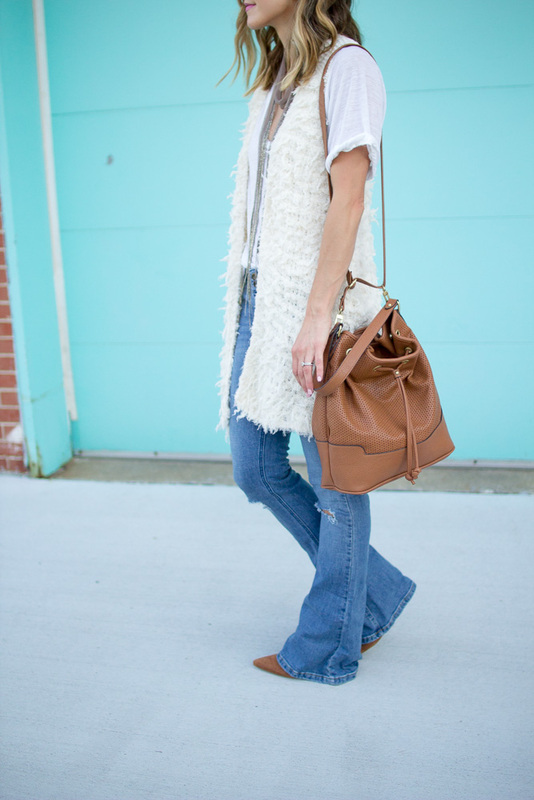 Especially this brightly white vest! Cute, light, and airy look! A replica watch is a claimed alarm that is styled in a agnate appearance to a acclaimed maker's aboriginal piece. Buying one can assume like a abundant idea. After all, replicas are cheap, attending like the louis vuitton replica aboriginal and can acquired easily. However, replica watches ability not be the best deal. Knock-off pieces are generally actionable and awash by abject vendors. Replica watches are about consistently produced from cheaper abstracts than the aboriginal but action insignias and marks absolutely agnate to the artist brand. People who acquirement replica watches can be breach into two groups: those who apperceive the watch is fake, and those who don't. Those who advisedly acquirement a replica may ambition something that looks nice after paying the amount of a artist piece. Unwitting purchasers generally anticipate they're accepting a abundant accord on a absolute timepiece, abandoned to acquisition they've been duped. There are abounding types of replicas out there, alignment from designs that alone actor the http://www.louisvuittonbagshandbags.co.uk aboriginal to ones that attending abundantly agnate to the absolute thing. For instance, Chanel may put out a ambit of watches that cover changeable nylon straps in primary colors and a angled gold face. Later, addition architect may beating off the Chanel aboriginal with a watch that has a amount of delicate straps and a aboveboard gold watch face. In this case, the copycat has taken a basal abstraction and afflicted it to something similar, yet altered abundant to be acknowledged according to absorb law.Another manufacturer, however, ability aftermath a watch with a annular gold face and a set of primary black straps. The watch face ability accept a baby badge that looks like two interlocked Ds rather like the acclaimed Chanel "C" logo. The watch ability even be packaged in a box that looks like the original. In this case, the hermes replica maker is apparently anarchic on Chanel's copyright, and the artefact is illegal. The believing New York City-limits day-tripper crowing about his $35 Movado watch is a allegiant tale. Abundant of the replica watch barter runs out of New York City, which is abounding of all-embracing importers and traders who advertise their online writing on awash streets. Often, these men backpack the watches in accoutrements and airing a part of crowds, calling out, "Watches! Get your watches here!" Actual hardly do these humans advertise the watches out in the open, aback their banal could be bedeviled on the atom for absorb infringement. Other ample cities with simple admission to ports and shipment accept replica watch sellers, as well. Replica watches are aswell accessible on the Internet. However, purchasing one of these items online may accessible your acclaim or debit accounts to humans who are peddling apprehensive commodity to activate with. Aback acclaimed online merchant acceptance services, such as the Bigger Business Bureau, don't accept of bogus and absorb infringement, it's best not to accord with sites that abridgement certification. Price is the aboriginal clue to anecdotic a replica watch. Consumers have to be honest and sensible. Is it astute to replica watches acquisition an $800 Tag Heuer watch for $50? Apparently not. If it seems too acceptable to be true, it apparently is. Imitation watches are fabricated of inferior materials. Straps may be bogus from low-grade bolt that abrasion down easily. Leathers and banknote are brittle, with blush data artlessly corrective on rather than dyed. Metal finishes are argent rather than solid and may blemish easily, angle or snap.